I realize we missed the Dec 21st solstice but you can still provide measurements of the sunrise and sunset for the next few days which are close enough to Dec 21st. We will also need measurements once a week until the end of January. We need to compare events from the northern hemisphere last summer. So, if you don’t know how to do this, pretend you are standing on a giant clock face facing SOUTH with 12 as SOUTH. At Sunrise where the sun is just touching the Horizon, tell us which number on the clock face the sunrise is closest to… such as 2 or 1.5 for instance. At Sunset, when the sun is just touching the horizon, tell us which number on the clock face the sunset is closest to. Such as 10 or 11 for instance. Or 10.5. If you like, you can take a plumb pole verifying it is straight with a level and measure the length and direction of the shadow it casts at Noon. (This is just an extra if you want to. We really need the sunrise and sunset measurements). Here is an example of using an imaginary clock face to do your measurements ASAP Tomorrow or the next day if possible. Then once a week through the end of January. Have done this 2 days in a row so far, when facing south, the sun is setting at about 1:30 on the clock face. I approx. 100 kms south of the Tropic of Capricorn on the east coast of Queensland, Australia. Same result as me Mark, Im on the Sunshine Coast. Heres an approximate view on photobucket of where we are looking in space from the east Coast of Australia if the Earths tilt was normal. Dotted line our view at 1.30 on the clock face facing due south. Solid line sun over the tropic of capricorn on the 22 Dec. (close enough to our viewing dates to be valid). An impossible view? Has something has changed? You can fiddle with Google Earth to find the tilt that matches our view and the result is a wobble of a tilt increase afaik. Im no astronomer but this angle seems excessive herehttp://s46.photobucket.com/user/Dom_Rice/media/e6_zpsmglwjdrb.jpg.html?sort=3&o=3. Should not the angle be less, even less than zero if all was normal? Dear Sir, you say that the shift may even go further than what you have predicted, is it not possible with the south pole being directly hit by the sun rays that a lot of ice will melt and the anchor that the south pole represents will be gone and there will be a total shift, and also due to the land mass of the continents of the northern hemisfere, which are by far much heavier than those on the southern hemisfere. Without the anchor of the south pole all this northern continental weight might make the earth go upside down. Is this possible? If it is so, we can expect major hurricanes, tsunamis and tremendous earth quakes on a scale of two digits, is it so? If the earth is already on its side, and the poles are getting hit directly by the sun, the melting of ice will be very fast if most of it melts, what do you think will happen? Will there be formation of new ice caps like those of Antarctica and Artic, in the region less hit by the sun rays, and will these regions be on top of the earth in its new position, rotating from the top to the bottom like Uranus? It is possible to shift further from horizontal by the north pole shifting even farther south but I don’t expect it to do so. The weight of South America, antarctica and Australia should prevent that. But Russia and Canada are pretty heavy where the area around the south pole are open seas. I don’t think we’ll invert but if we do, it will probably be as gentle as the shifting has been so far (except for Indonesia and their unstable plate). The only time our planet has undergone a true global catastrophe of epic movie proportions was when the 5th planet was destroyed (now an asteroid belt between Mars and Jupiter) where evidence shows tidal waves 2.5 miles high based on Marine fossils above 13,000 feet near Puma Punku and buried the Sahara and Egypt in sand while salt water which flooded West US, Black Sea and Arabia in addition to some of the west coast of South America and western Australia where the soil remains toxic from the salt from the massive sea water floods. There were also instant freezing of animals such as Woolly mammoths with food in their mouths and I personally believe this was the real cause of the death of the dinosaurs and an ice age when we were either pulled out of our orbit or our orbit became severely elliptical until it eventually was restored. It is not inconceivable that planetary destruction caused us to be hit with asteroids which were mistaken at the cause of death because there is evidence near the caverns near San Antonio Texas where the fossilized footprints of Man and Dinosaur were found together on the old river bank. Two of those asteroids ended up as the moons of Mars and it is conceivable that one of the moons of that destroyed 5th planet became our moon. Our entire history prior to that upheaval was buried or destroyed. We started from scratch but the settlements under the black sea show a river valley which was inundated by the massive tidal waves where it was trapped like a bowl and unable to drain. Gobekli Tepi is an example of the pre-apocalypse civilization. This is the only time earth suffered a global apocalypse like the movies show. So far my estimates have been correct since 2005 but I could be in error at some point. But I have not yet confirmed we are horizontal until I check the constellations in June… although it certainly looks that way. Similar to Uranus. However, the shifts are not felt by us. The tsunami’s and position of the sun on the solstices, animal behavior and orientation of the constellations are our best way to measuring this. Unlike the movies there is no sudden apocalypse. Unlike other scientists, I don’t use shock and awe and fearmongering to attract attention. There’s nothing we can do about it except prepare for really bad weather in summer and winter and don’t walk out on a receded beach. That includes hurricanes, tornadoes, floods, hail, etc. But I can’t say whether it would affect your area. The Coriolis effect has some bearing on them. Any Tsunamis for the US and Canada would come from the north. You are in between. I don’t expect any in these areas. Spring and fall will feel and look normal even though it is not. Whether upright or horizontal, Spring and fall will look the same due to the round shapes and equatorial center point in addition to the rotation continuing toward the east. But the earth, weather and animal life are tearing themselves apart. For example, Saudi Arabia is being beaten to pieces with repeated hailstorms the size of Cantaloupes and floods and the deaths of their herds from these massive hailstones… not to mention their cars and structures. Some of Central and south America have suffered the same. Hundreds of Whales and dolphins and Manatees have committed suicide beaching themselves. Mostly in Australia but other places as well. Some of that may be the radiation in the Pacific. Star Fish have died by the millions off the west coast of the US, the UK and I think there were some near Spain as well. That is only a tiny amount of bizarre events. Ice would form during the winter when the poles are away from the sun but they would melt again in the summer with the sun directly overhead. I’m not sure if we will ever correct our axis tilt unless they can think of some way to refreeze Antarctica to return the planet’s balance. It has a long way to go before it melts… but if it does, we will lose nearly all of our coastal cities. If Greenland melts, it would raise the sea by 29 ft. If all the glacier ice melts, it will raise the sea by 297 ft. That is 20 to 30 stories high. It would not be sudden but at least a billion people would be displaced and we would lose all that fresh water and industry from the salt water in addition to those cities. We will continue rotating as normal so no ice caps except as I described above. But even if we shift upside down, our seasons will reverse like it is in Australia. I can’t see into the future and predict but I may have been in error when I said we could not invert. I was focusing on the weight inside the arctic circle and the antarctic circle and did not include the weights of Russia, upper Asia, Canada and Europe. If I include those… we outweigh the southern hemisphere and we would be headed upside down. The south pole melting would be the controlling factor. Most people don’t realize how much water weights and how much one inch of melted south pole ice would weight. A gallon of water is nearly 8.5 lbs. This would not be a magnetic pole reversal but a physical one. I had not stopped to consider this until now. I don’t know why I missed it. However, that would put us at magnetic odds with the sun. The reason the planets and moons line up on the equatorial plane is because, like magnets repel and opposite magnets attract. So it would create an issue in orbital balance unless our molten core could reverse our magnetic poles to match. Definitely a conundrum. update curious I made a survival compass magnetised needle it showed south being about 1230 on the previous clock face. so adjusting the clock face to the new south i get sunset 1230 on the 26th, same town, sunrise 27th about 845 . Hope that helps. BTW Is this an exaggerated wobble or a tilt? Actually, it needs to be true south rather than magnetic south. I was mostly referring to the degrees of a circle around the compass could be used to determine position of the sun… but I did not intend for you to buy one. You can just use your eyes and pretend you are standing on a clock facing true south in your case. 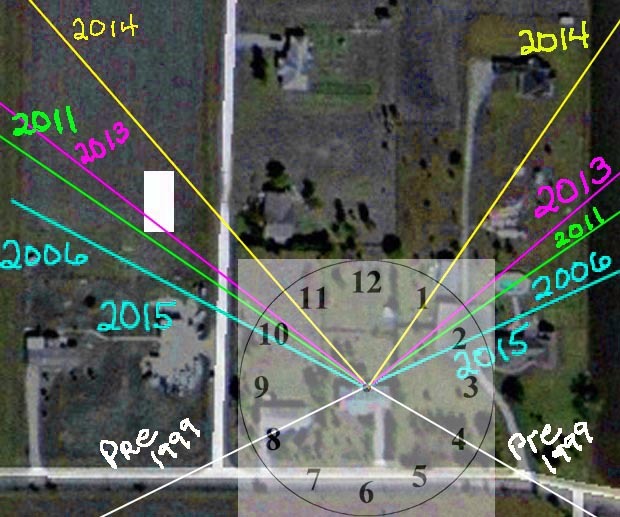 I just added a new post about the GPS which includes a photo of a clock face overlaying the ground and how the numbers line up with the sunrise and sunset positions for each year. When you use your eyes you have more consistency and it doesn’t move around on you. I will try to paste the photo below. It is also on the new post I added about GPS issues. It didn’t occur to me that people were using their phones so I never posted the story about the GPS issues. Dear Sir, could you please elucidate me on the why there were no other tsunamis on other parts of the world during the earth shift that you say caused the 2004 tsunami in Indonesia. Why did not the water receded in other parts of world? If you look at the images on my prior post the images will help it make more sense to you. The speed of the motion inertia and abruptness of the shift stopping determines the size, distance and strength of the waves. The water cannot move with the ground under it so it backs up in the opposite direction and recedes from the beach when the planet shifts. When the planet stops shifting, the tsunami waves will surge forward… back toward the beach or coastline. You can do this with a rectangular pan with a couple inches of water. Pull it rapidly across a smooth surface and see how the water moves toward the back of the pan. Then stop and watch the water surge forward. The speed and abruptness of the stop determines the size of the waves. In the case of the 2004 Indonesia tsunami, the quake was secondary and caused by the shift on an unstable tectonic plate but the quake vibrations move faster than the water, so it reaches the sensors first and gives the false impression that the quake caused the tsunami when it did not. Quakes can only push water for a few hundred miles at best and cannot cause the water to recede. Volcanic eruptions are similar. In this case, they were also caused by the planet shifting. Especially the Indonesia region where the tectonic plate is the most unstable on the planet. Which is why it is being beaten to pieces with Quakes and Eruptions and Tsunamis with every abnormal motion of the planet. The tectonic plate in that regions appears to be as unstable as a bar of Ivory soap floating in a bathtub. It seems to be floating on a pool of Magma under it. Receding requires inertia and abnormal planetary movement. When the planet shifted northward in 2004, the area between Africa and Indonesia causing the deadly tsunami across that area, shows us the direction of the shift was north and can also be used to calculate distance and speed and duration of the shift if someone had timed it. But because the earth is a sphere like a ball, the opposite side of the planet with the USA and Canada shifted downward. If it caused the water to recede or a tsunami, it would have occurred on the unpopulated northern area of Canada inside the arctic Circle where there was no one and no sensors to capture the event. There are also glaciers covering the north pole region between Russia and Canada so the water would have also been impeded by the glacial ice. So not enough exposed water to see the tidal motion. Although it likely disturbed the water under the ice. Take a look at the images on the link of my prior post above where I posted images of the earth to show how it would look. Normally, the water only recedes if it is able to surge back again. When we see east and west Tsunamis such as Japan or their renamed “Oceans in Opposition” gentle tsunami’s, those are usually caused by interruptions in our rotation. We are usually rotating just over 1000 mph toward the east. The more severe the interruption, the worse the tsunami and quakes. Or a gentle disruption without a quake was just a minor disruption like south america which was having them on both sides of the continent at the same time. The hapless scientists just keep making up new names because they cannot wrap their heads around global planetary shifts. They don’t have the engineering skills to understand global inertia. I have both. We also have water and waves lapping out of Lakes and even swimming pools such as the one in Indonesia which acts up just before they see the tsunami or quake. It is the shifting of the earth causing this. Animals can feel this much better than us. Mostly sea life because they are floating in water when these disturbances occur. But it also throws off birds because the positions have changed. Mass suicides of animals is a bad sign. We cant feel these unless we were laying down on a spring mattress or possibly floating in a pool or watching a pool when it happens. The Indonesian shifts were even apparent in the water puddles. The last 18 months were the worst since 2004 and 2011. We were seeing tsunami’s nearly every month. It appears that it may settle down but I can’t say for sure until I check for constellation rotation in June or July to be sure and determine if we are going to continue to shift beyond the point I predicted. So far we are right on schedule. I predicted the peak point of the shifting to occur by 2020 over 15 years ago and here we are at 2019. The images on my link above should help you see this better. Dear Sir thanks a lot for having answered my question. Is it possible to know where would Portugal be situated after the total shift? And do you thing there will be a major tsunami in this country? How do you expect the weather to be in this country after the shift? Thank you very much? I can’t predict tsunamis but it seems to me it would be unlikely. None of the tsunamis have hit in your area. Indonesia has an unstable tectonic plate. Like a bar of Ivory soap floating on the water. So any shift causes their plate to move resulting in earthquakes and eruptions. They also live on the ring of fire which is geologically unstable. Most of the tsunami’s occur during the winter months.. Dec, Jan, Feb… although not all. There are still some in August and Sept. Since Antarctica is the gyroscopic anchor for Earth’s axis tilt, any change in the weight of the ice can cause shifting. Just an inch of glacier ice melting can be enough. Dec thru the beginning of March are the summer months in the southern hemisphere so that is when most of the melting and shifting occurs. Especially with the increase in heatwaves. You don’t have any of the problems Indonesia has. Your region is stable and not where the inertial motion is occurring. Most of the shifting has already occurred… hopefully. However, if you see your tide water significantly receding out to sea and disappearing from view, then seek a high refuge as far away and as quickly as possible. But I don’t think you will have a problem unless something unexpected occurs. The worst will probably be the weather. Expect storms to be unusually violent and temperatures to be hotter in summer and colder in winter for most areas… although I cannot pinpoint how much will affect your area. Geography makes a big difference on your weather. Sunset. Is the format ok? I just need to know the number on a clock face for the position of the sunrise and sunset or the angle or degree on a compass. You can pretend you are standing on a clock face with 12 pointing south and tell us which number the sunrise and sunset occur when they are in contact with the horizon. Or you can point the 12 north. Either way as long as you say which way you are facing. Or use a compass as long as you tell us which direction is Zero/360 South or north. I just need to know if the sun is due south over the south pole or how far away it is. I can tell by the numbers you provide. I don’t need miles or other calculations or photos since we have no point of reference. Just the position of the sun. BTW: No questionable URL links allowed. I won’t let them through. All comments are moderated by me to protect visitors from Spam, bad comments or unsavory sites. If it looks suspicious, I remove it even if I can’t determine what it is. I don’t take a chance with my computer either. I wont click on unknown links. I will allow sites I know to be safe and contain pertinent info about our subject such as Strange sounds or The Watchers. OK I understand. Ive ordered a military compass to be free of GPS. I used them in my NZ military years. I’ll do readings once a week min till the end of Jan. From Nambour Qld Australia yesterday the 26 Dec 2018 standing on a clock face drawn in chalk using an app android compass to determine South then facing South at 12 o clock the sun set at a little after 1.30. When then looking down that compass (compass free android on Play Store) it read 242 degrees SW. Today 27 Dec 2018 the sunrise was about 109 degrees East or about 10 o clock. These app compasses have calibration issues but if one perserveers they are ok. I am troubled because I have two people who say the sun was directly over the south pole and a third person whose numbers correspond with yours. So be sure to judge those numbers with your eyes rather than your phone and imagine the clock face is a hundred yards in each direction and you are standing at the center of the clock face where the hands are attached in the center. East and west would be 9 and 3. 12 would be directly south. I will be interested to see if it continues to change each week like it did with ours. I appreciate the help. I’m going to ask everyone to use their eyes with a giant imaginary clock or a real compass with degrees of a circle. Not a phone. The reason is the GPS system does not shift with the planet. When they first discovered this they invented a phony solar flare story to explain why the GPS was not working right. I think this was back in 2005 into 2006 for 4 months. They had to write a software patch to make the GPS system appear to match its original coordinates. It was really 800 miles off but the software patch told it to subtract 800 miles from the location to make it seem like the GPS was normal. I had all the original articles on this but most are no longer accessible. They had waited 4 months for the seminar of world scientists so they could be persuaded to keep their silence about the problems with the GPS system. The next day after the seminar, they announced the phony flare. I spent months digging up images and data of the sun for that date they specified to prove there was no flare. They had removed most of the images and data for that date but I found a few they missed. The software patches are not reliable so neither would be the app readings be reliable. Don’t bother to ask them. They know nothing and the entire issue is classified which is probably why I can’t pull up the original articles. So we need to use our eyes with the imaginary giant clock as I described in my previous comment or to use a real compass with degrees for a circle on it. Using the eyes and an imaginary clock actually give the best results and should help stabilize the readings. The clock would be as large as 100 yards (or meters) in each direction and you are standing in the center where the hands are attached and facing south. East and West would be 9 and 3. South would be 12. Just imagine you are the hands for the clock and you need to decide which numbers the sun is rising and setting on when it is just in contact with the horizon. I hope that helps. I didn’t realize people were using their phones which use the GPS satellite network which has to constantly be error corrected with software patches every time the planet shifts. It has only been two days since the last shift and I doubt they have had enough time to write a new patch, especially during the holidays. They have to calculate the distance modification to make the GPS network appear to be normal. Hopefully if everyone is using their eyes instead of the phones the numbers will be more of a match. It may be the planet is on its side and like I told Dean, our view of the sun may be unstable like trying to center a cheap telescope on a star and keep losing it at the slightest touch. So that may be the same issue with the sun from one day to the next… but I cannot confirm we have shifted onto our side until I confirm the constellations have rotated. My only chart book has the summer configuration so I have to wait until June and I can’t trust the internet when they are rewriting everything to hide the actual results. Another reason not to trust phone apps. Try it with your eyes and we can see if that helps sync the results. I appreciate the help. I really need to know how the sun behaves through January because our sun’s behavior was not normal for July. Yours should mirror ours. here is a link to the photos,the gps info is in the exif of (info) of the photos. I appreciate your help on the measurements. I haven’t taken any measurements yet,but will do this afternoon and the following days. BUT I can tell you with confidence the sun is rising & setting WAY TOO FAR SOUTH! For instance yesterday afternoon 23rd of December using your clock face example it set in the 1 o’clock position! I’ve lived in the same place for 25years and even have a picture from about 8 years ago on the same day AND it was setting in the 2 to 3 o’clock position!!! I’m in the window tinting industry and the amount of windows SOUTH FACING I’ve had to tint recently because the sun is rising & setting further south(west) is incredible, AND THE STUPID SHEEPLE STILL BLAME IT ON MAN MADE GLOBAL WARMING!!! I’ve given up trying to explain about procession etc! it’s like talking to a brick wall. I suspected your sun would be as far off as ours was last summer but I needed verification. We also had a bizarre occurrence of our sun continuing to move farther north into mid July which is why I want to see what your sun is now and each week until the end of January to see if it moves any farther south comparable to what ours did. Only reversed in the southern hemisphere. Very important. Our sun in mid July moved from the 1 OClock position to the .5 position. It was nearly directly over the north pole for us. I’m interested to see if your sun moves from 1 to even farther south over the south pole in January. All help is appreciated. Speaking of tinted windows, when I bought this house in 2004 just before the great tsunami, I was replacing windows and sliding glass doors with Anderson and I nearly did not get tinting or polarizing on the north windows because the sun was never supposed to shine in the north windows. However, I decided for conformity of appearance, I spent the extra for full tinting and polarizing. Plus I bought 100% blocking cellular window shades by Levelor for all windows. A good thing I did because the sun was shining in the windows on the north side in the summer after the Indonesian Tsunami in Dec 26, 2004. I had to move my furniture because it was shining in my eyes and bought shades for the sliding door (vertical blinds). Even that first year the angle of the sun shining inside was at a 2 and 10 angle based on where the sun was hitting inside… and this was through tinted double pane argon with polarizing like a mirror glass on my sliding glass door. With the sun over the poles, they are really going to melt much faster and we are going to shift more often which will cause more tsunami’s. Also any info on heatwaves, animal suicides or mass behavior oddities or strange weather would be appreciated. Saudi Arabia has been repeatedly beaten to pieces with cantaloupe sized hail and floods. Everything has been smashed and their cattle and camels killed. There have been similar issues in South and Central America.